The SeaTrepid Comanche is an ideal source when seeking a work class solution in a small package. Offering a generous 15kW / 20 hp hydraulic power unit for work class manipulation and tooling combined with a powerful control and diagnostics package for survey and other data collection, the Comanche offers high performance, high reliability, and high adaptability while still providing important customer benefits with regard to capital, reliability, and requiring less deck space than comparable systems. This system has been developed for these and other tasks: Construction IRM – cleaning, cutting, NDT; drill / rig / completion support and well intervention (for example AX-VX gasket change out, BOP shutdown, fluid injection, hot stabbing, drilling and tapping) Additionally, survey including pre/post pipe/cable lay and touch-down monitoring, diver support, renewable energy, submarine or maritime rescue, munitions search and recovery, scientific research and data/sample collection plus numerous other missions. 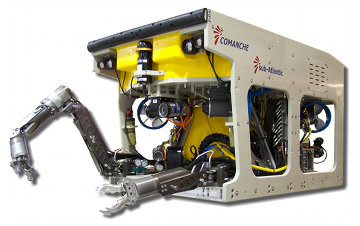 Optional equipment include survey expansion electronics pods, Industry standard manipulators (7 and 4 function) and cutters, Dredge systems, High Definition cameras and lights, Live download of digital stills, Motion and navigation reference sensors, geophysical and bathymetric sensors, NDT sensors, Cleaning jets and brushes, pipe and cable tracking and inspection, threat detection, and imaging intervention systems all fall within the availability of the Comanche ROV system.